Happy New Year! Admittedly it has taken me considerably longer to write this than I had hoped. I'm currently weighed down by a stinking virus/flu bug. I've had several mind blanks followed by eureka moments, when I actually managed to remember some of the most momentous times of 2016! Anyhoo.. no bug is keeping me down and out, so here is my 2016 reflections post, as well as a few resolutions for 2017. The first 6 months of 2016 were incredibly strong for me! I had my stuff together and had a regular schedule, which believe it or not I actually stuck too. My photography also improved a huge amount and the messages I had and still get really do warm my heart, as my photography was something I struggled with in the earlier days of blogging. During the latter part of 2016 my motivation dropped and there was a period of time during the summer, which saw me take on a huge role at work, which to be honest I wasn't quite expecting. A little fish in a big ocean springs to mind! I started to become a little trapped in my blog and its "beauty" label, which brings me to my NEW LAYOUT!! I'm in love and I hope you like it as much as I do. Not only that my blog is now called "India-Robyn" which has totally got my blogging buzz going wild again. I actually managed to schedule six posts and I've never ever been able to do that. There are still a few changes due, including a new logo and I need to work on my domains and a few other little ventures that will all come to light early in 2017. I've been lucky to travel to many beautiful places in the world in my 24 years, but actually a trip to Bordeaux to watch Wales play in the Euros along with Daniel and his best friends was honestly one of the best experiences of my life. Okay, so it did feel a little like a stag do and it was a tiny bit Leary at times, but I couldn't believe the kindness I experienced from everyone in Bordeaux, even fans from other countries were extremely kind and "shook" my hand and said good luck before the game. Seeing Wales blossom and play as a real team in the Euros was also hugely inspiring and totally blitzed expectations. It taught me a lesson (not just how to drink and keep up with men) but actually that anything is possible and that negativity is sometimes a blessing in disguise, as it can give you so much determination to come back stronger! I also visited Dubai again in 2016 to celebrate mine and Daniel's 1st year engagement anniversary. We stayed at the Atlantis for the second time and it was equally as beautiful and amazing as the first. Another amazing trip I went on was to London in August with one of my best friends Sophia. We enjoyed a stunning Afternoon Tea at the Ritz, followed by a delicious evening meal at STK. The following day Daniel came to London to meet me and we went to watch Liverpool vs Barcelona at the new Wembley Stadium, it was a great weekend. Work, Work, Work, Work, WORK! What can I say as annoying as it may be that song comes into my head every single time I mention work. During the summer a pretty big transition happened, which has now led me into a new role as Marketing Campaigns Officer! I couldn't be happier. The responsibility is huge in my new role and a lot of decisions I have to make regarding campaigns have a direct effect on the business, but it doesn't phase me! I love a challenge. I'm really excited to run with this new role in the New Year. Not only that but Daniel also graduated with a first in Mechanical Engineering and also has a fantastic new role! Next year will mark 9 years together and we have both come so far! As much as he does my head in, he truly is my rock. 2016 has been another whirlwind year with highs and lows! However, lets welcome 2017 with open arms and hope that it's prosperous for us all. And don't forget... 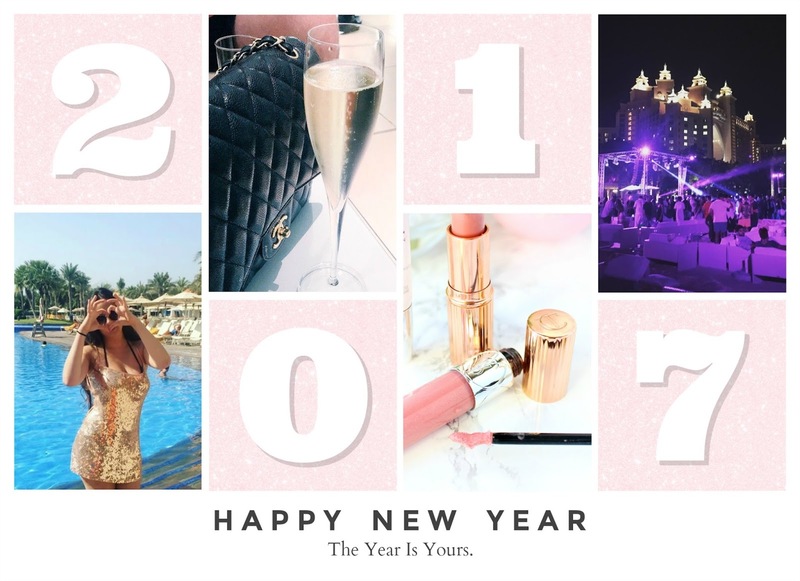 The Year Is Yours!